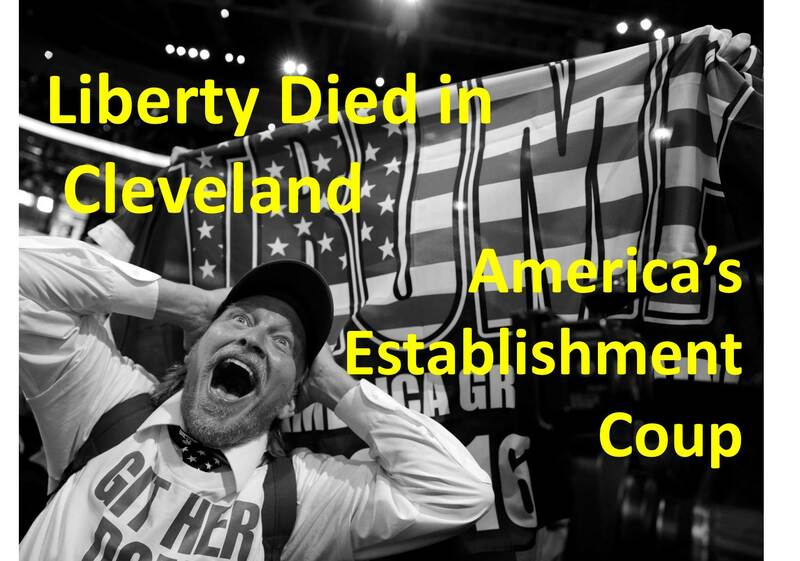 Liberty died in Cleveland on Tuesday. The coronation of Donald Trump as the GOP nominee in 2016 further consolidated the power of establishment elites in Washington, DC. During this election cycle, establishment elites in both the Republican and Democrat parties have seized greater power while crushing their grassroots rivals. Sanders supporters seem to grasp that establishment Democrats rigged their nominating process to coalesce behind Hillary Clinton. Trump supporters, however, are blind to the reality that they are backing a purported anti-establishment nominee who has always been part of the establishment. To do so, they obstructed the campaign of the only truly anti-establishment candidate in this race: Ted Cruz. Indeed, at the convention, they cheered when the Republican establishment squashed efforts to allow delegates to vote their conscience and they booed when Ted Cruz urged American citizens to vote their conscience. When did heeding your conscience become a bad thing? Barack Obama ruthlessly wields his pen and phone to circumvent the Constitution and thwart the will of the People. Hillary Clinton is self-evidently a statist averse to the rule of law and wants to further transform America in even more fundamental ways. Donald Trump, also a statist, is an authoritarian bully to boot, and he has proven his propensity to use his boots to stamp on human faces forever, as so vividly pictured by George Orwell. That more people hate their respective party’s candidates than like them shows the extent to which the establishment opposes the will of the People to pursue their own ends. Both Hillary and Trump are anathema to lovers of Liberty and America. Even though the establishment Left & Right have seized control and consolidated their power, the fight must go on for Liberty. The American spirit can only succeed when it is committed and engaged in the fight. Let us fight for Liberty! See “The End of the American Experiment?” at http://wp.me/p4scHf-eZ. See “Why Brad Thor is #NeverTrump! Litmus test is liberty!” at http://wp.me/p4scHf-fb. See “How to Talk to a Bully (if you must)” at http://wp.me/p4scHf-cY. See “Will Ann Coulter Apologize to Michelle Fields?” at http://wp.me/p4jHFp-di. See “Stop Insisting I Vote!” at http://wp.me/p4scHf-f5. This entry was posted in Uncategorized and tagged American spirit, anti-Establishment, authoritarian, Barack Obama, Bernie Sanders, big government, bully, Cleveland, conscience, Constitution, constitutionalist, delegate revolt, Democrats, Donald Trump, election 2016, Establishment, freedom, fundamental transformation of America, George Orwell, GOP Convention, grassroots, Hillary Clinton, liberty, Never Hillary, Never Trump, Never Trump or Hillary, pen and phone, Republicans, statism, Tea Party, Ted Cruz on July 22, 2016 by BrotherWatch.